New York State has recently passed new legislation regarding the management of concussions in the school setting. It is called the Concussion management and Awareness Act and it went into effect on July 1, 2012.
parents of student-athletes must sign a permission slip before their kids can participate in practice or games. If it is their second or more concussion they must be symptom free for seven to ten days and have a doctor's note. Each school coach, physical education teachers, school nurses, and athletic trainers are also required to complete an approved course on concussion management on a biennial basis, starting with the 2012-2013 school year. This assessment is designed to be used on the sideline at the time of injury. It is now available as an app for all smart phones. PACE (Protecting Athletes through Concussion Education) is the nation’s largest concussion baseline screening initiative. ImCAT™ (ImPACT Concussion Awareness Tool) was developed to educate athletes, parents, teachers and coaches about the common signs and symptoms of concussions. The ImCAT smart phone application includes educational information and a quiz on concussions and mild traumatic brain injuries. Users also have the capability to track details of an athlete's injury like their symptoms, and when and where the injury occurred. After the injury information is recorded individuals can email it to themselves to assist in the athlete's post injury evaluation. ImPACT - (Immediate Post-Concussion Assessment and Cognitive Testing) is the first, most-widely used, and most scientifically validated computerized concussion evaluation system. 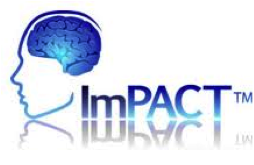 ImPACT was developed to provide useful information to assist qualified practitioners in making sound return to play decisions following concussions.